Repairs proposed for this year include a £1.8million four-month project on the A941 Craigellachie Bridge to resurface the road and pavement as well faults with the structure. A £2 million crowdfunding campaign has been launched to help restore an iconic Moray bridge. 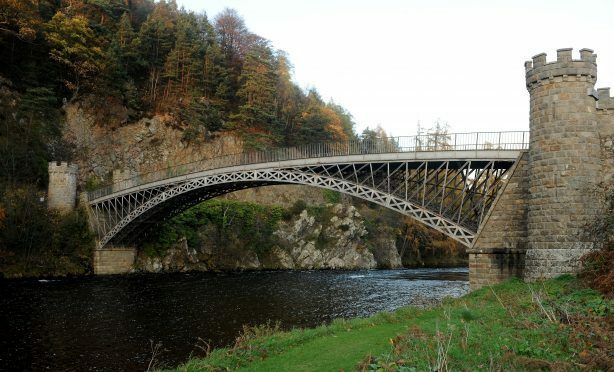 The Craigellachie Bridge is a local landmark and a popular tourist attraction in Speyside. Tourists flock to the 200-year-old cast iron crossing every year and it is synonymous with the whisky industry. However, its condition has deteriorated because the metal is beginning to rust which can lead to then stonework loosening. Now, a fundraising campaign has been launched by John Stewart, a chartered civil engineer, who wants to refurbish the landmark structure. There have been a number of attempts to revitalise the bridge over the years. The Friends of Craigellachie Bridge was formed in 2015 with the aim of improving the crossing. However, their proposals for a £450,000 restoration have been held up by the fact that no one knows for certain who actually owns the tourist attraction. Moray Council has been asked to review their own records to try and establish whether they own the bridge or not. Friends of Craigellachie Bridge trustee Jock Anderson is hoping for positive news this year, as the campaign group look to take their next steps in taking over ownership of the bridge. He said: “At the moment we are still trying to create a plan that will see us set up funding for a feasibility study so we can see what needs done. “Once ownership is established, the council want to hand it over to either the Friends or someone else on a 25 year lease. The group is now working with Paul Higson from the North East Preservation Trust and Roger Goodyear who worked on restoring the Portsoy Salmon Bothy. The Craigellachie Bridge is a category A-listed structure. The 200-year-old crossing is one of the few engineering projects in Scotland that has been recognised as a landmark of importance by both the UK’s Institution of Civil Engineers and its American equivalent. Designed by the renowned civil engineer Thomas Telford, it was built between 1812 and 1814 but is now only used as a footbridge following the creation of a vehicle crossing nearby. It cost about £8,000 when it was first built, with all that money raised through public donations. The structure is the oldest surviving monumental cast iron bridge in Scotland and one of the oldest in the UK. In 2015, the bridge was celebrated in a new set of Royal Mail stamps. Although Moray Council do maintain the crossing, mystery surrounds who actually owns it, with the local authority claiming it does not have an official record. However, Moray MSP Richard Lochhead uncovered historical records from the 1970s which suggest the bridge was the responsibility of the former Joint County Council of Moray and Nairn, a predecessor of the current organisation.